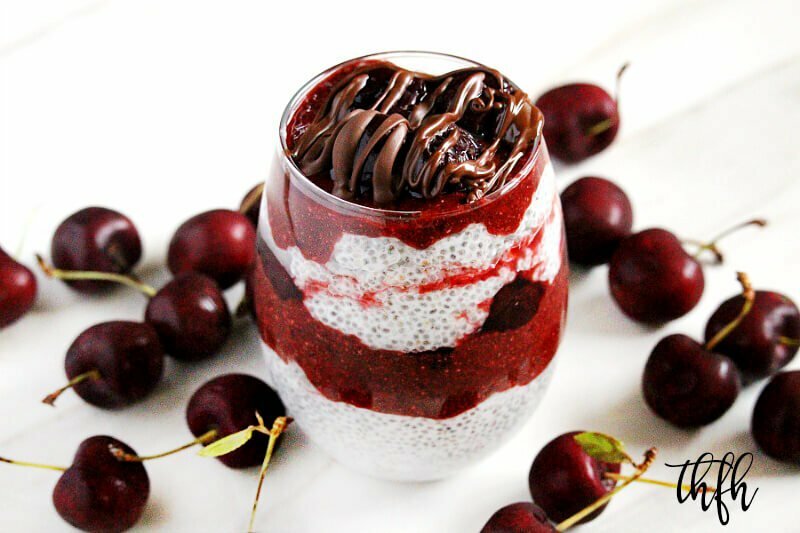 In this Vegan Black Forest Chia Seed Pudding Parfait recipe, I’ve combined a classic chia pudding with a dark cherry + chocolate combination. 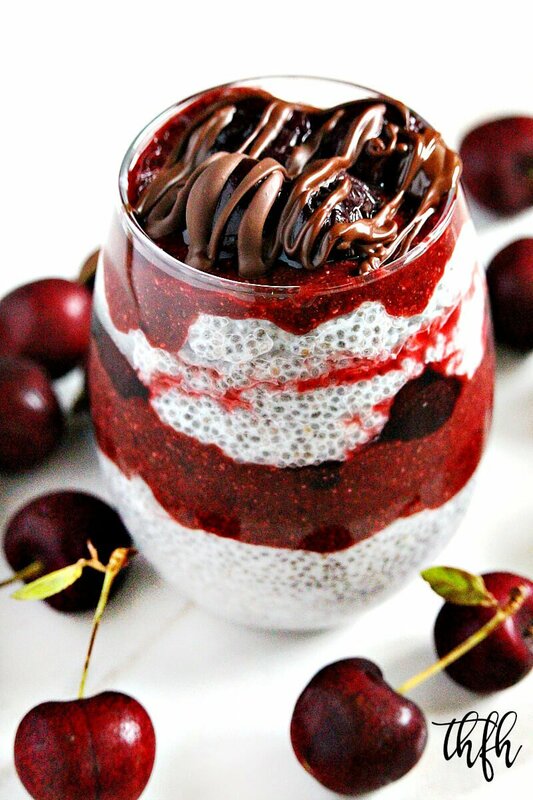 It has a thick, sweetened plain chia pudding layer + dark cherry chia seed jam layer + dark cherries + melted chocolate layer – twice! It only takes a few minutes to make each step and I used my Vitamix to make both the chia pudding and chia jam in a matter of minutes. The recipe is enough to make one large serving or two smaller servings. Have fun and make a large serving and share it with someone special! And don’t worry about being precise with the amounts you put in each layer…it isn’t critical so feel free to use as much or as little of each as you like. But…try to use organic cherries, if possible, because non-organic cherries can contain up to 42 different pesticides and please, please, please don’t buy or use the red food colored cherries in a jar with an ingredient list like this: Cherries, Corn Syrup, Citric Acid, Natural and Artificial Flavors. Preserved with: Sodium Benzoate and Potassium Sorbate, Red 40, Sulfur Dioxide (Preservative). This easy and healthy recipe is raw, vegan, gluten-free, dairy-free, soy-free, no-cook, paleo-friendly and contains no refined sugar. Want more healthy dessert recipes? Check out Clean Eating Vegan Cherry Tart, Dark Cherry and Acai Berry Smoothie Bowl, Gluten-Free Vegan Chocolate Covered Strawberry Truffles or my Clean Eating Cookbook with over 3 entire chapters of healthy, clean eating recipes just like this one that you will love! Add all the ingredients for the chia pudding to a Vitamix and pulse 5-6 short times, only long enough to mix the ingredients together, but taking care not to over process. You don't want the chia seeds to be broken down. Transfer the mixture to a small bowl and refrigerate for about 15 minutes, or until it firms up. Add all the ingredients for the dark cherry chia jam to a Vitamix and pulse or blend until the cherries are broken down, but taking care not to over process. Set aside. I gave you the ingredient list for a full batch of dark cherry chia jam, but you won't need to use but about 1/4 of it for this recipe. Just store the extra in an air-tight BPA-free container in the refrigerator. Add all the ingredients for the chocolate add-in to a small saucepan and melt on lowest heat, stirring until it is smooth and well blended, taking care not to let it burn. Set aside. The recipe and photographs for "Vegan Black Forest Chia Seed Pudding Parfait" by Karielyn Tillman of The Healthy Family and Home website are licensed under a Creative Commons Attribution Non-Commercial No Derivatives 4.0 International License and cannot be used without my written permission.